What is an IOC? or What is Inversion of Control? IOC is mechanism by which we can add abstraction between dependencies to make them loosely coupled code. Abstraction is added through interface. Now lets understand this by example. I have a class called "Black_And_White_Printer" which has one print() method. Print() method will print in black and white. I also have consumer class which is dependent on Black_And_White_Printer class. Notice: Consumer class is tightly coupled with Black_And_White_Printer class. Now let say after few months of this implementation management comes up with ColourFull_Printer and now they want Colour print rather than black and white. Notice: Because our Consumer class is tightly coupled with Black_And_White_Printer class, we now have to change consumer class on changing the method of print. In other words our consumer class is dependent on mechanism of print and that is reason we have to change every single time. Tightly coupled code. i.e. Consumer is tightly dependent on Printing mechanism. Requires more maintenance. i.e. Whenever printing mechanism change we have to change our consumer class. Not good for writing unit test cases. 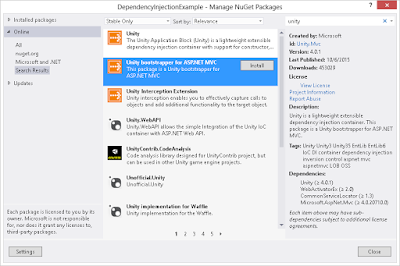 Now, lets perform IOC on above code. Again: IOC is mechanism by which we can add abstraction between dependencies to make them loosely coupled code. Abstraction is added through interface. so In order to remove dependency betweeen consumer class and printing mechanism add an layer of abstraction using interface. In above code: We first added interface name IPrinter which contains print() method. Now each printing mechanism is required to implement IPrinter interface. That is our case both Black_And_White_Printer class and ColurFull_Printer class has to implement IPrinter. 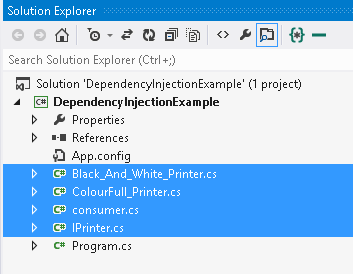 Now notice inside consumer class we introduce Constructor Dependency Injection method to perform IOC. Loosely coupled code. i.e. Consumer is no more depended on Printing mechanism. Requires less maintenance. i.e. Whenever printing mechanism change we are not required to change our consumer class. Good for writing unit test cases. Dependency Injection is mechanism by which we can inject dependency into component. 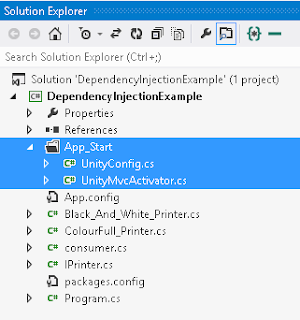 Considering our above example concept now I will show how can we perform Dependency Injection using Unity Framework. As per above code create a console application and add files along with code as mentioned above. After its installation it will add folder App_Start and 2 files. 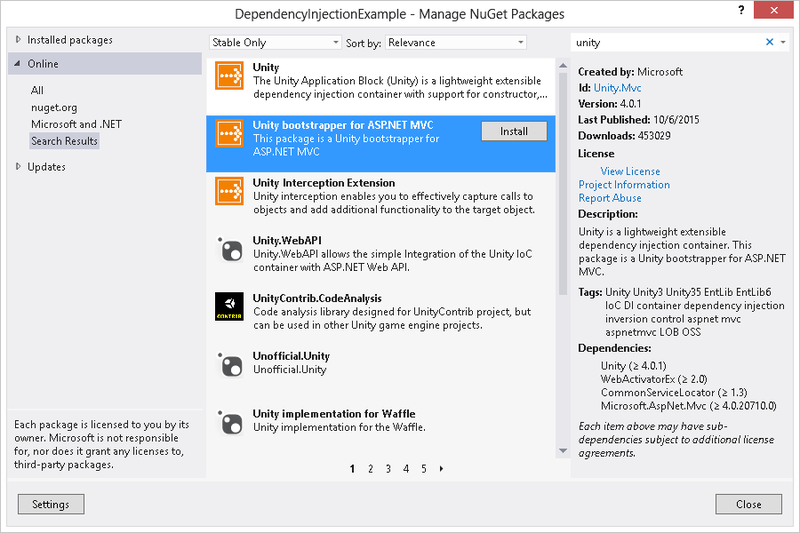 Now open UnityConfig.cs. We should be maintain all dependencies in this files. Note: Above code is displaying "Black and White Print" because inside UnityConfig.cs our IPrinter interface is pointing to Black_And_White_Printer class. 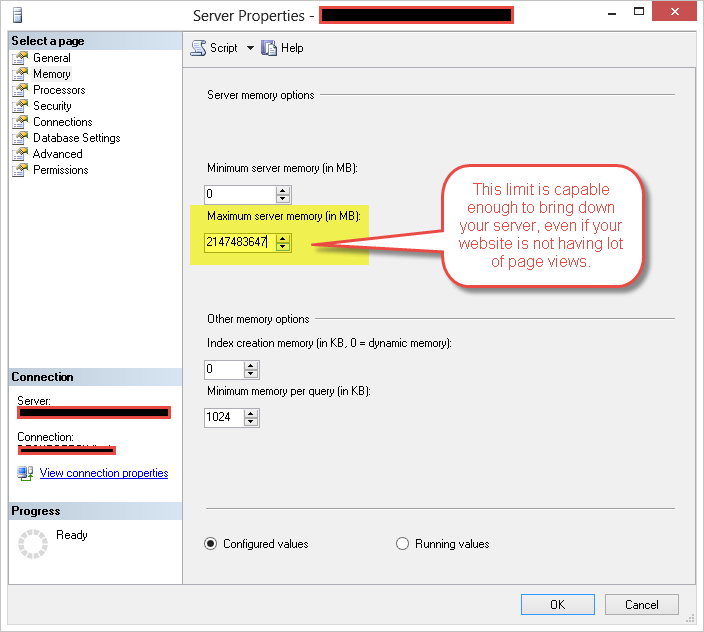 With growing of sql server database size and increase in page views of website, you might run in to memory crunch situation. Please note: You might run into memory crunch situation for number of reasons like memory leak in code, etc, but in this article we will be focusing on only one scenario that is restricting sql server memory usage. 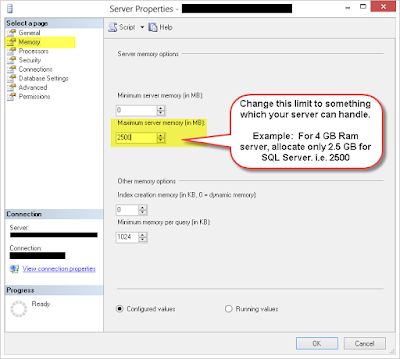 By default if you have not restricted sql server memory usage, it can use upto 2147483647. Restrict the memory consumption of SQL Server by changing this limit to something which is reasonably your server can handle. Special Thanks to my friend Pankaj Mishra for sharing this information. 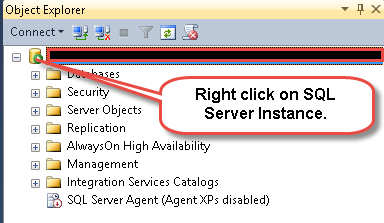 Good link describing how asp.net mvc request/response pipeline works. 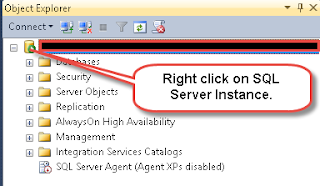 If you are planning to make a custom security layer then this links may interest you.